Hue is the quality by which we distinguish one color from another, as a red from a yellow, a green from a blue. In science it can be measured and identified by its position within the visible spectrum. On the Munsell Hue circle, there are 5 Principal hues: Red (R), Yellow (Y), Green (G), Blue (B), Purple (P) and 5 Intermediate hues: Yellow-Red (YR), Green-Yellow (GY), Blue-Green (BG), Purple-Blue (PB), Red-Purple (RP). When a color is void of hue it is called a Neutral, such as Neutral Gray or Neutral Black. On the Munsell Hue circle it is an axis in the middle (N). Each of the 10 Hues (both principal + intermediate) are then further subdivided into 10. As you move clockwise around the circle the 5 of each Hue is the principal center of that color family, while the 10 of each Hue is considered the intermediate. Even finer distinctions can be made between similar Hues through the use of decimals. A Munsell Notation is always written in a specific order as a fraction. The Munsell Color Order System is a way of precisely specifying colors and showing the relationships among color based on a three-dimensional model. Every color has three attributes: Hue, Value and Chroma. 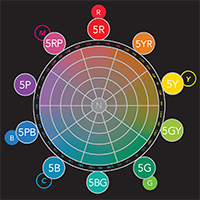 The primary hues in the RGB or CMYK models are shown around the Munsell Hue circle to show how they relate to the Munsell Principal and Intermediate colors. Red, Green, and Blue are the primary colors for this additive color model in which red, green, and blue light are added together in various ways to reproduce a broad array of colors. Equal amounts of RGB = White. Cyan, Magenta, Yellow, and Black are the primary colors used in printing for full-color documents. Mixing varied percentages of of these four inks reproduce colors. Equal amounts of CMY minus Black (K) = Dark Brown. 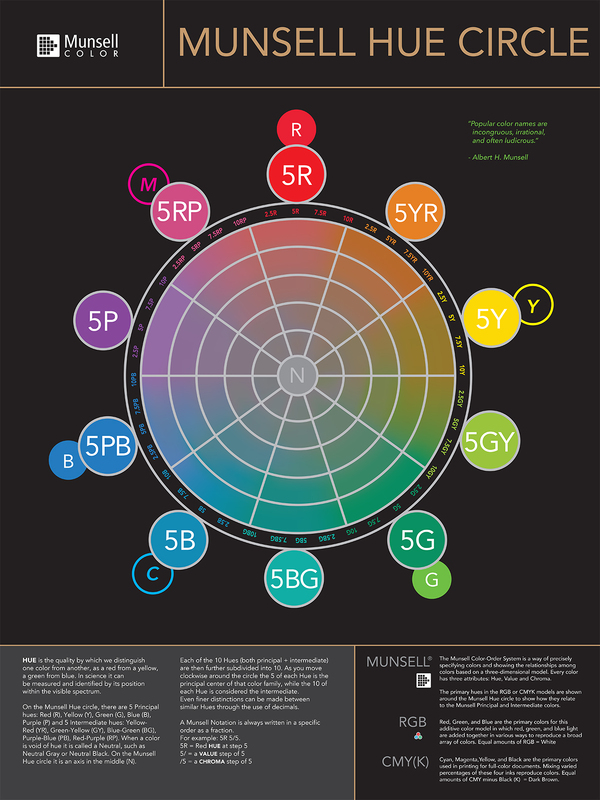 Munsell Hue Circle Posters are available to purchase for $35. Please contact us for more information. The Munsell colour wheel seems to suffer the same incongruity as the other colour wheels – in order to bend the spectrum into a continuous circle, a non-spectrum hue of red-purple or red-violet has been introduced. It’s real enough, we can see it and modify its value and chroma – but it’s not really part of the spectrum. How does this come about? Spectral colors can be produced by monochromatic (single wavelength or neary-single wavelength bands of light) but the non-spectral colors can only be produced by mixing lights of different wavelengths. What we see depends upon the ratios of stimulation of the three cone types that are respectively responsive to Short Wave, Middle Wave or Long Wave light. Very roughly speaking, we can see red when only the LW cone is stimulated but if we are to see purple both the LW and SW cones must be stimulated. Is this poster available for classrooms? I first began using the Munsell color chart when Frank Covino, the portrait artist and instructor of Old Master style painting, introduced it to his students. Now I wouldn’t consider trying to paint without first laying out the Munsell colors. It takes the mystery and guess work out of painting composition.